This hair oil is so very effective for treating premature greying and for conditioning the hair. This hair oil is for people who cannot use fenugreek hair mask. Fenugreek hair mask is very effective and using both the fenugreek oil and the hair mask is a great hair treatment, but if you have sinus infection, try using this oil as a pre shampoo treatment. This oil is very very good as a pre shampoo treatment. This hair oil preparation needs a little patience to make. Fresh Aloe Vera leaf is cut and fenugreek seeds are sprinkled in the middle and tied. The next day, the seeds would have sprouted, now take the seeds and dry it completely in the sun and immerse it in coconut oil. I will give step by step instructions on how to do it very soon. Some people suffer from itchy skin, even small insect bites will trigger intense itchiness of the skin. A simple homemade bath powder made with 350 gms of fenugreek, 100 gms of turmeric, 100 gms of kasthuri turmeric & 100 gms of white turmeric and used as a bath powder eliminates body itching very effectively. To make this powder, sun dry all the ingredients and powder it finely and store in an air tight container. When you suffer from itching, take this powder and mix it into a paste with water and apply all over the body, wait for few minutes before washing it off. on the day you are using this powder, make sure not to use soap or other chemicals on the skin. Even people prone to skin allergies will benefit from using this powder. remedies that I have grown up with, gives me so much pleasure. A simple tea made with fenugreek seeds reduces hot flushes in women, increases blood supply in women, stabilizes blood sugar levels, and is very good for people suffering from constipation. Making this tea is simplicity itself, take fenugreek seeds and crush lightly using a mortar and pestle, now take them in a pot and add hot water to it, let it steep for a few minutes before straining. You can sweeten with honey too. This tea has been consumed all over the world for it’s wonderful benefits. Usually after getting fever, our body will be weak and will not be able to digest heavy foods. So we usually make a porridge | Kanji with fenugreek seeds and broken rice and give to the patients. This is easy on the stomach and heals them faster. Grind 1/4 cup of rice coarsely in a dry mixer and take it in a cooker along with a tsp of fenugreek seeds and cook till mushy. Now remove the lid and add 1/4 cup of fresh coconut milk along with a bit of salt. Do not boil it for longer, just heat it lightly and switch off. The mixture should be like a runny soup. Both coconut milk and fenugreek heals wounds caused in the stomach after a course of antibiotics taken for fever. Fenugreek infusion made by boiling fenugreek seeds with water to a thicker concentrate, when used as a gargle relieves sore throat. To make this home remedy, soak fenugreek for an hour and then boil with the same soaked water for 15 to 20 minutes in a very low flame. Once it is cooked, strain and while it is still war, mix little bit of salt to it and gargle with this infusion. People with sore throat can use this infusion to gargle often to get rid of sore throat fast. Fenugreek seeds are amazing for diabetic patients. It is hard to consume to fenugreek seeds but if you soak them in water overnight, it is much easier to eat them. We include fenugreek seeds in our diet in a number of ways, we include it in our seasonings, make dosais, include it all our batters, etc. All the dishes mad with vendhayam keeps us fuller for a longer period of time reducing un wanted cravings. I have never struggled for adding fenugreek in the diet because all our traditional dishes include fenugreek. If you are a diabetic, try not to eat out a lot and consume our traditional foods like vendhaya dosai, vendhaya porridge along with other whole grain recipes to stabilize the blood sugar levels. Fenugreek seeds are very good for lactating mothers. In many parts of India, fenugreek halwa made with fenugreek seeds and jaggery is given to newly delivered moms. This halwa increases immunity and strengthens immune system of new moms. This halwa also increases the breast milk supply, try to include fenugreek seeds more in the diet, if you are a lactating mother. I am giving a mother feed to my child.can use this hair mask.how to create a yogurt.curd +sugar huh ? You can use the hair mask, when you are feeding. 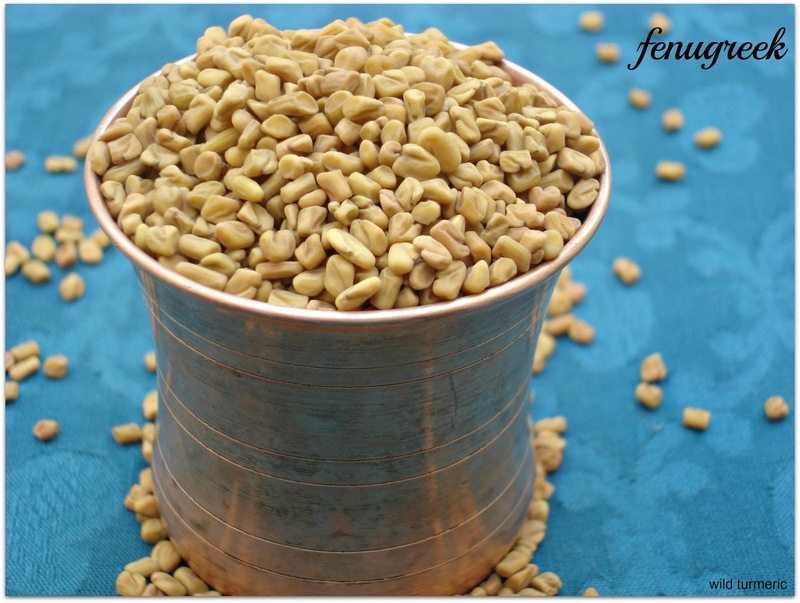 Yogurt is another name for curd…..
Fenugreek is a wonderful spice !. Ramya's post is so informative and useful and we should be thankful to her .I have been consuming it for more than a year as a home remedy to cure diabetes ( in addition to metformin tablets) and have noticed good results, probably due to the fact that fenugreek is said to promote insulin secretion naturally. I usually soak a teaspoon of fenugreek seeds in water for more than 12 hrs and consume both the water as well as the soaked seeds first thing in the morning. In addition to its proven anti diabetic uses, it has also proved to be a good bowel cleanser.Also I am free from heartburn and aciditiy, which I occassionally used to suffer from. I wish and hope more and more people should make the best use of this easily available & inexpensive spice and reap its wonderful benefits. Shal I soak fenugreek in water overnight and drink that water with that seed daily morning ??? is it true soak overnight and drinking the water help cleanse the body including fatty cell? If we use the fenugreek for diabetic men. Does it reduce their fertility? Can I use curry leaves along with fenugreek and curd for hair mask? I am 25 yr old women and newly married.if I take reguraly at morning time with empty stomach,what will happend. If you are not diabetic ( fenugreek will reduce blood sugar levels so they have to monitor it carefully) consuming vendhayam will not cause any problems at all. Is it good for High Blood Pressure? Mam, Whether I can drink vendhayam soaked water while playing badminton, as da playing condition (indoor) is humid and is there any side effects??? Hello mam i hope u r good, I have dandruff problem for 2 yrs and If i drink fenugreek water every day early morning once after wake up do i can get relief from dandruff problem. I have GERD and Ileatis.Now I am taking a teaspoon full of overnight soaked venthayam.Ifeelcomfortable and a free bowel movement. Hii mam, i saw one drink which help to reduce weight,in tht one tea spoon of vandhaiyam,seeragam,3 to 4 piece of curry leaf,small ginger piece 2 to 3,half lemon,then 3 tea spoon of honey.i must have in morning and night.i heard vendhaiyam,lemon and ginger will affect health later on.i am not diabetic but I am epilepsy patient.suggest me. Mam , How combination of vendhayam and Jeera mixed water overnight and effect of the same.